Jeweller talks of love of jewels and balancing wholesale and retail. Jewellery designer and retail store owner Alexis Dove was recently unveiled as a Tresor Paris Trendsetter in the Professional Jeweller Hot 100 2012 in association with The Company of Master Jewellers. She speaks to us about how jewellery has become a way of life for the whole family, the benefits of being both a wholesaler and a retailer and ramping up her PR. 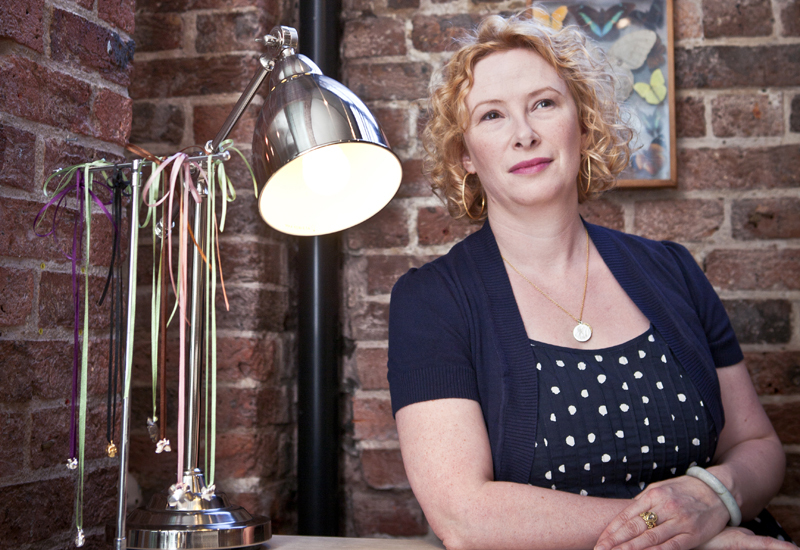 Professional Jeweller: How has your business evolved this year? Alexis Dove: It has been an amazing year for me with some very exciting new ventures including being selected for Goldsmith’s Best of British initiative and being stocked in Highgrove. The wholesale distribution has continued to grow, I have invested in re-developing the Alexis Dove website and my e-commerce business has grown substantially over the past year. The Alexis Dove shop in Lewes has become more established now that it is in its third year. I have also re-branded, moving away from my designer-maker background into a contemporary jewellery brand, which has been an exciting process working with artist Tom Homewood on the project. The new branding, which includes new POS materials, gift boxes and bags, will be fully launched during IJL. And I have worked closely with CMJ Media to promote the Alexis Dove brand and collections, gaining some important coverage in national magazines and having my jewellery worn and photographed on celebrities like Dame Kelly Holmes. PJ: Sounds like a busy year. How do you keep going? AD: I am very lucky to have the support of my partner Justin Small, who is a goldsmith, who has always believed in me and encouraged me to make my business what it is today. PJ: Can you give us a snapshot history of your business? AD: I started my business in 2006 launching my first website and selling to wholesale customers as my business grew I opened my own workshop in 2007 and then in 2010 my first shop and in 2011 launched a new retail website. PJ: Has the rising cost of precious metals proved challenging? AD: Each year I face new challenges. The price of metal has been one of the most challenging, but I have adapted my jewellery collections to reflect this including making more bespoke pieces. I think having a wide base to my business has allowed me to better understand what is happening in the marketplace and adapt accordingly. PJ: What inspires you as a designer? AD: Nature has always been a key theme for me, as I come from a background in agriculture. I also grew up with the South Downs on my doorstep and love the flora and fauna that are common to that landscape. But I also have a fascination with history and spend hours in museums. The British Museum is my favourite – partly because it was where my partner Justin and I had our first date. Cabinets of curiosities are a particular inspiration for me at the moment as they bring together all of the themes that inspire me most and they have a slightly macabre side that is part of both nature and history. PJ: As you mentioned, you have been working hard to evolve from a designer-maker into a brand, how is that journey going? AD: I have just rebranded to reflect this move to designer brand, which is very important to me. I have enjoyed working with artist Tom Homewood on the project as he is a fabulous designer and artist. He really understood what I wanted and where I saw my business in the future. I have invested a lot of time into transforming into a designer brand and have seen the collections taken up by more stockists as a result. PJ: At your store you stock a number of other designers’ work. How do you balance being a designer and a retailer? AD: In my store I stock 85% of my own work as I see it as being the home of Alexis Dove, a place where you can find all of the collections under one roof. I also trial new designs before launching them to wholesale, so that I can give my retail customers confidence in buying collections that have already been tried and tested. The most important element of the shop to my business is the bespoke commission service, which focuses mainly on wedding and engagement work in our style. We create mainly one off pieces for our customers and have dedicated 50% of the store over to this. I enjoy retailing because it allows me to meet my customers and to work with them to create unique pieces. It inspires me as a designer and keeps my feet on the ground. PJ: How do you pick which desigers to stock? AD: I choose other designers work based on how they will fit into the ethos of the store, especially choosing collections that complement my jewellery. I also look to introducing new and unusual British designers. I want to encourage my customers to choose something different, especially for their weddings and special occasions. PJ: You have been part of the new Goldsmiths project – tell us a little about how this has affected your business and how it came about. AD: I met the Goldsmiths buyers at The Jewellery Show in Birmingham this February and was invited to their head office in Leicester to show them the collections. They were selecting jewellery designers from a wide range of British designers who make their work in the UK. It has been a challenge keeping production in the UK with the rising costs associated with this, but the Goldsmiths initiative has helped me to reach a wider audience and interest them in British designers. It is a great opportunity to be part of and I truly believe it will be good for British designers and other retailers who also believe in promoting designer jewellery. AD: I am very lucky to be doing something I love and I would say that jewellery is an obsession and a passion, which I get to indulge every day. PJ: How do you manage your work-life balance? My partner Justin works alongside me in the workshop and shop so we do spend most of our time talking about jewellery. We often talk late into the night about new ideas – to me jewellery is a way of life. My step-daughter has just started making some jewellery in her spare time so it’s a real family thing for us. PJ: When you’re not thinking about jewellery, what captures your imagination? AD: I like to read and love history and graphic novels the most, I also love to explore European cities, especially Paris and Brussels, where I spend hours in flea markets looking for vintage curiosities to inspire new collections. AD: I am sure it will be another busy year for me with new collections to finalise and I would like to take the store to the next level offering more choice and bespoke services to all of our customers, including our wholesale customers. It will be an important year for me to establish the brand now that I have re-branded and to find ways to reach a wider audience, with the help of CMJ Media of course.